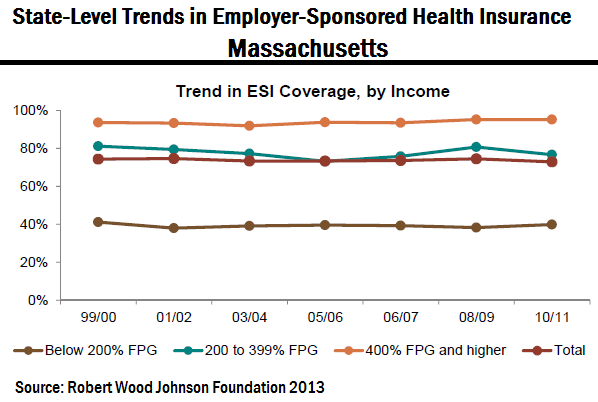 In April, the Robert Wood Johnson Foundation (RWJF) released a study highlighting declines in employer coverage across all states for which data was available. Only 56 percent of workers 18 and younger were covered by employer-sponsored health insurance (ESI), down from 76 percent in 2000. Coverage fell from 78 percent in 2000 to 65 percent in 2011 for workers age 26 to retirement. The loss of coverage was primarily attributed to loss of jobs or employees’ inability to pay matching portions of premiums as health insurance costs rose rather than a reduction in the number of companies offering ESI. 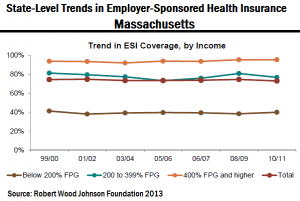 Nationally, the percentage of private-sector firms offering ESI fell from 58.9 percent to 52.4 percent (although the percentage of workers eligible for coverage at firms that offered ESI held steady). Not surprisingly, the major change was at small firms where ESI fell from 67.7 percent to 56.3 percent while at large firms it remained essentially unchanged. Overhaul of employee benefits communications and E-to-E communications in general. Increased sophistication in health insurance marketing to employer and employee segments as well as improved wellness and retention communications to plan members. As state governments get involved in healthcare exchanges they will also have increased communications requirements. As you start to see new plans and communications roll out – please let us know. Contact me to post examples using the contact form on the blog.